1985: First organizational meeting held in Fremont to determine interest in starting a statewide quilt guild. 60 participants attended from 18 communities. Meeting headed by Sara Dillow who was then elected the first president of NSQG. Organizing emphasis: to develop small and large groups for "friendship & quilts". 1986: First NSQG newsletter published and official logo chosen. By May membership reaches 500 (ranging in age from 17 to 77) representing more than 100 communities. First annual meeting, QuiltNebraska, held in Grand Island with a Celebrity Auction. Nebraska Quilter's Hall of Fame established. "Pride of Nebraska" category established at State Fair Quilt Show. Quilt exhibit: "100 years of Nebraska History Through Quilting" - held in Capitol building rotunda in Lincoln. 1987: Speaker's Bureau established and Awards Committee formed. Proceeds of the NSQG raffle quilt used to build the quilt display frames for the state fair. NSQG State Fair Committee created to help with the display and staffing of the fair quilt show. QuiltNebraska held in North Platte. 1988: First QuiltNebraska symposium held in Omaha. NSQG sponsors national quilt contest, "Prairie Homecoming" in conjunction with Duncan Aviation. Library Project Committee created to distribute quilt books to all Nebraska Libraries on an annual basis. NSQG begins to hold "Quilter's Day Out" parties around the state to promote the guild. The guild donates $1000 to the Nebraska Quilt History Project to register, photograph, and document nearly 4000 quilts across the state. Quilt exhibit: "My Antonia" held at the Willa Cather Conference in Red Cloud. 1989: "QuiltNebraska Shines" project held as part of QuiltNebraska in Grand Island - 325 quilters create quilt blocks to be set together and presented to designated public and non-profit facilities. 1990: On the fifth anniversary the membership reaches 800. Progressive and Challenge quilt contests established as part of QuiltNebraska, which was held in Kearney. NSQG promotes quilting to Saline County 4-Hers. Over 200 quilts entered in Nebraska State Fair Quilt Show. Lady's Circle Patchwork Quilts Magazine comes to Nebraska to create two publications on Nebraska quilts and quiltmakers. 1991: Quilt Preservation Project proposed by NSQG Museum Committee after three year study. QuiltNebraska held in Valentine allowing quilters to raft down the Niobrara River as part of the conference. 1992: NSQG sponsors wall quilt contest to celebrate 125 years of Nebraska statehood. The winning quilts are displayed in the rotunda of the Capital Building in Lincoln during the statehood celebrations in March and at the "Nebraska's Birthday Bash" quilt show in August. QuiltNebraska held in Lincoln. 1993: Fundraising begins for the Quilt Preservation Project. NSQG participates in the Ground Water Festival in Grand Island to promote quilting to Nebraska school children. QuiltNebraska is held in Hastings and is nearly flooded out. 1994: First Quilt History Day held in conjunction with QuiltNebraska in North Platte. NSQG participates in the Ground Water Festival for 2nd year. The Quilt Preservation Project begins documenting the quilt collections in 106 museums across the state. 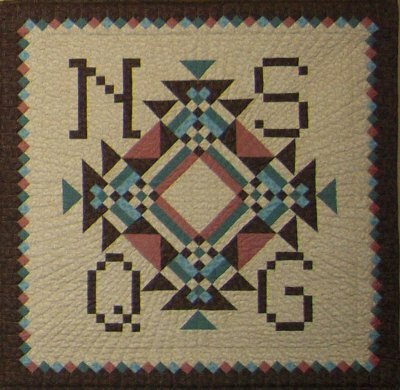 1995: NSQG celebrates tenth anniversary at QuiltNebraska in Omaha. The Quilt Preservation Project hosts a Quilt History/Research Day. NSQG participates in the Ground Water Festival for 3rd year and donates six quilts created from blocks made by students during previous festivals, the quilts were used as fundraisers for the Groundwater Foundation. 1996: Contemporary quilts from the James Collection exhibited at Sheldon Art Gallery in Lincoln, Jonathan Holstein speaks at the reception. QuiltNebraska held in Kearney. 1997: Third year of Quilt Preservation Project - 2009 quilts documented. The Project is presented the Hugh H. Genoways Award of Achievement. The International Quilt Study Center is established at the University of Nebraska - Lincoln and it receives the donation of 950 quilts from the James Collection valued at approximately 6 million dollars. Several pages of color photos printed in the NSQG Newsletter for the first time featuring winning quilts from the state fair. QuiltNebraska is held in Chadron. 1998: The James Gang Pledge Committee is created to begin fundraising for a 10-year, $150,000 pledge to the International Quilt Study Center. Fundraising activities include the Stash Stampede at quilt shops across the state and the publication of the NSQG Legacy Cookbook. QuiltNebraska held in Lincoln at the Cornhusker Hotel. 1999: Surfin Stitchers on-line e-mail communication formalized for NSQG members. The NSQG Education Committee creates "Discover Nebraska" programs for fourth grade Nebraska studies. First full-color issue of the NSQG Newsletter published. QuiltNebraska returns to Grand Island. 2000: Fundraising for the James Gang Pledge continues with a silent auction of items donated by NSQG members. At QuiltNebraska in North Platte a special display of past NSQG raffle quilts hang in celebration of the guild's fifteenth anniversary. 2001: The NSQG membership tops 1000. The NSQG quilt collection becomes a part of the International Quilt Study Center. NSQG donates materials to Love Library at the University of Nebraska to create the NSQG Archives. QuiltNebraska held at Kearney. 2002: NSQG co-sponsors a national quilt contest with the Willa Cather Spring Festival in Red Cloud. The James Gang Pledge committee holds an auction of small quilts donated by members as a fundraiser at QuiltNebraska in Omaha. 2003: NSQG continues to support the state fair quilt display by donating the monies needed to add new lighting. QuiltNebraska held in Chadron where temperatures reach over 110 degrees. Two Strategic Planning meetings held to set goals for future NSQG growth and development. NSQG raffle quilt, Hot Lava, wins best of show at the state fair. 2004: The James Gang Pledge Committee completes its goal of raising $150,000 for the IQSC, four years ahead of schedule. The first NSQG website is created to promote the guild and enhance communication with its members. Committee formed to scan all NSQG scrapbooks to CDs for preservation and ease in accessing information. QuiltNebraska returns to the Cornhusker Hotel in Lincoln. 2005: The first “Threads Across Nebraska” is held in Kearney, with over 2000 people attending. The NSQG membership votes to pledge $150,000 to the International Quilt Study Center Museum building fund. The State Fair quilt display is moved to the air conditioned Bob Devaney Sports Center. QuiltNebraska returns to North Platte. 2006: The official groundbreaking for the new IQSC building takes place in May. The 2007 raffle quilt, “Nebraska’s Rising Sun” is unveiled at QuiltNebraska in Kearney, and ALL tickets are sold out that weekend. 2007: NSQG members attend a Ricky Tims Seminar, sponsored by the Omaha Quilters’ Guild as a fund raiser for the IQSC building fund. Region III sponsors a “Quilt Gathering” at the Panhandle Research & Extension Center. QuiltNebraska is held at the Doubletree in Omaha. 2008: Nebraska quilters mourn the loss of Sara Dillow, NSQG’s organizer and first president. The Grand Opening of the new International Quilt Study Center & Museum is held in March. NSQG sponsors “A Week with Nancy Crow” workshop as a fund raiser for the IQSC building fund. Region II sponsors a “Quilt Gathering” in Tilden. QuiltNebraska returns to Chadron. To learn what the guild has been doing more recently, read through the newsletters archived here.